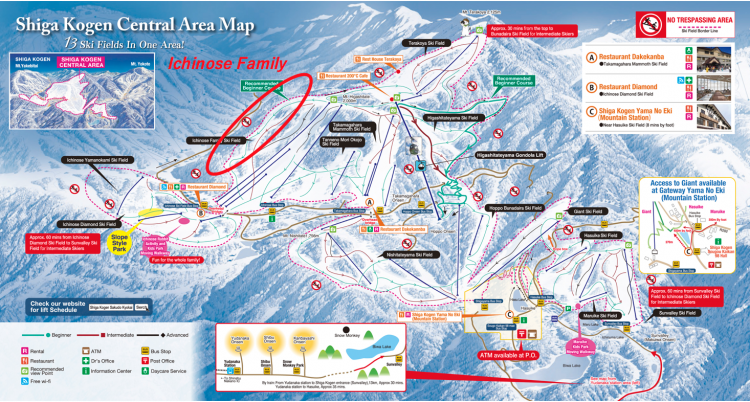 Another favorite area in Shiga Kogen for lovers of tree runs is a course which runs from the top of Ichinose Family Area down to bottom. It’s a little hard to find the course on the map so here is how to navigate yourself to it. The tree run runs parallel with the green (beginner) course circled on the map above. The forested area on the right hand side of the green course (when you’re actually on the run) allows for fun skiing and snowboarding and the ability to cut back onto the groomed course. In the second/lower half of the course, you will find another forested zone dividing the green and red (intermediate) course. You can cut easily between these areas to maximize your fun! How to enter the course: start by taking the longest quad lift to the top of the Ichinose Family and then turn to left onto the green course. As soon as you’re on the course you will see lots of small trees wide open on your right hand side. That’s the place and time to start enjoying the beautiful surroundings and excellent snow! See the video footage below for how the terrain looks. I have to admit that the video was taken at a time when there was less fresh snow so it wasn’t at its best but it was still a nice feeling to go through trees. If nothing else, it should help you to recognize the course. Enjoy!